Guilherme Pereira, a sociologist working with the Câmara da Lisboa, is the man who took us on our walk today from Black Horse Square – as known to the English who love to rename places in foreign lands - to Santo-O-Velho, at the foot of the French Embassy. Next time you are in the Terreiro do Paço, or Paços da Ribeira, or Black Horse Square, or Praça do Comércio, or Commerce Square – different eras gave different names to the Square depending on the commercial and administrative activities being held there – stand at the foot of the equestrian statue facing the sea. The statue was designed by Machado de Castro in 1775 representing King Joao I (1750-1777) in as Majesty. Look at the allegoric engraving or relief and try and make head or tail of it. It is a masterpiece of symbolic carvings that tells the tale of “Royalty's Generosity to Portugal”. The challenge to interpret all the symbolic figures in this stone plaque will constitute the next Quiz in the Newsletter! The Square is composed of 28 arches, now painted in bright yellow. Starting from the south-east corner, the three sides of the square once housed the following public buildings: East side: Stock Exchange (Bolsa), the Finanças, the first Post Office, the Ministry of the Interior, the Italian Café; North side (with the Triumphal Arch): the High Court (Tribunal), and the Ministry of Justice; West side: The Ministries for the Navy and the Army and the Royal Palace (Palacio Real), which was originally built by D. Manuel from 1490-1500, although the present tower (Torrião) is the third version after Rei Felipe II de Espanha built a larger one in 1580. Warehouses flanked the ministries to store the merchandise that was traded from the Portuguese colonies in Africa and also Brazil. 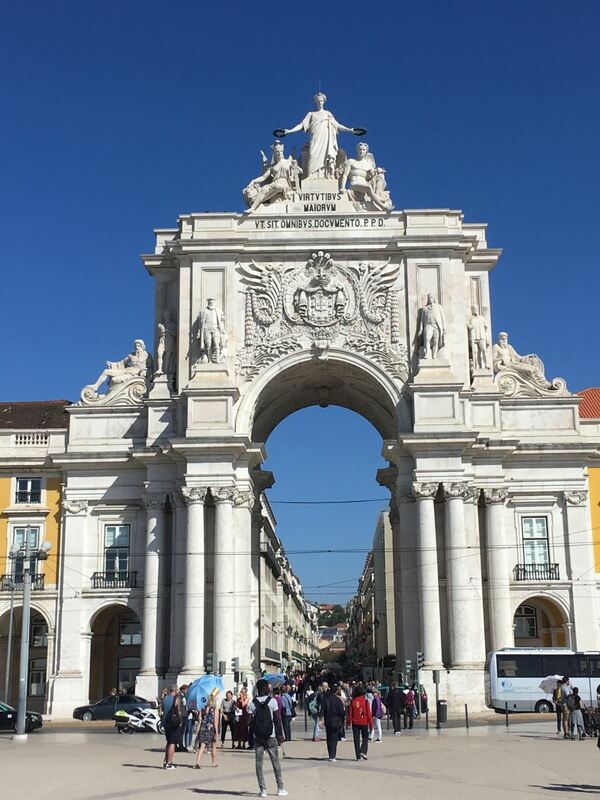 The Triumphal Arch on the far side leading into the city itself - via the Rua Augusta – is adorned with famous figures and places, namely (from east to west): the River Tejo, D. Nuno Alvares Pereira (with the sword), the Marquês do Pombal, Apollo (Genius), GLORIA, Athena (Victory), Viriato, Vasco da Gama, and the River Douro. The Square has been testimony to many historical events, such as Miguel Vasconcellos, the Secretary of State to the Duquesa de Mantua at the end of the Portuguese reign of Rei Felipe II, being thrown from the window of the Royal Palace during the Restoration of 1640, D. Carlos was assassinated at the north-west corner of the Square, and Salqueiro Maia entered with revolutionary troops on the 25th April, 1974. All these features and the illustrious history of the Square make the Terreiro do Paço one of the most emblematic and photographed locations of the whole city of Lisbon.